In March of 2009, Portland Bolt supplied ¾” galvanized hex bolts ranging in length from 10″ through 30″, as well as hot-dip galvanized all thread rod for the new Six Flags Buccaneer Battle ride in Gurnee, Illinois. This boat ride is a truly interactive experience which allows the ride participants the use water cannons to blast targets and each other. 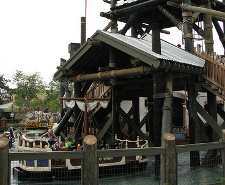 The ride even allows passersby to join in on the action by using water cannons stationed around the ride. Portland Bolt’s inventory of galvanized fasteners and in-house galvanizing facility allowed for a quick turnaround to keep the project on schedule. Our in house galvanizing line is specifically designed for threaded fasteners and all fasteners are hand checked to ensure the nuts assemble easily. This means no more galvanizing headaches or last minute fighting to assemble nuts in the field.